Joys Of A Wife And Mom: Simple Joys Photo: Trev and his "Dabarkads"
When I came back to him, this was what I saw. He gathered some of his toys beside him and cuddled them. Hahaha! He does this often actually, but with only one or two of his toys lang. Pero, this time, aba, he gathered more! 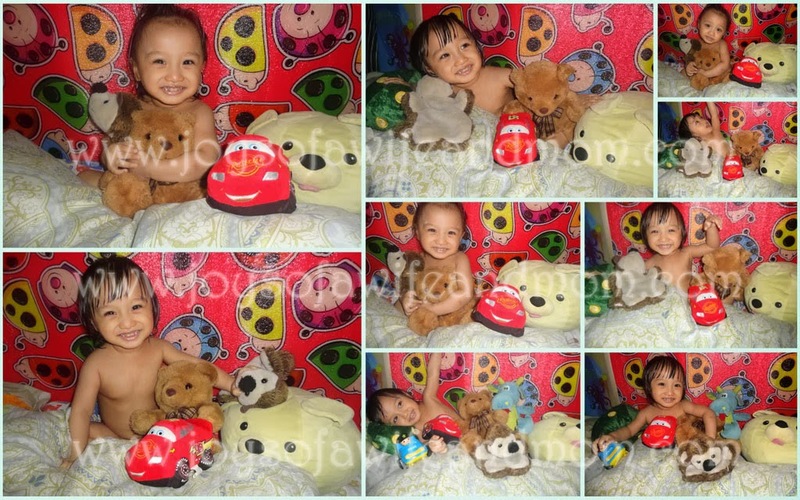 His favorite is actually Pacho (brown chipmunk puppet) and Teddy Bear. But he also loves Sab (yellow round dog) and Dino (blue dragon). He always makes Police Car and Lightning McQueen race, too. And oh, he sometimes cuddles Dice (green with yellow dots) because it's so soft. Cute. Laki na ni trev. Hahaha! Parang may pulong nga. Nakakatuwa naman at ang ganda ng smile ni Trev. Happy happy with friends hehehe.